Puzzi 30/4 11011200 https://www.kaercher.com/tn/professional/carpet-cleaner/spray-extraction-machines/Puzzi-30-4-11011200.html The Puzzi 30/4 spray extraction machine is the economical cleaning solution for large carpet surfaces and makes cleaning ergonomic, stress-free and quick. The Puzzi 30/4 spray extraction machine is the economical cleaning solution for large carpet surfaces and makes cleaning ergonomic, stress-free and quick. With a noise level of 66 dB (A), the Puzzi 30/4 spray extraction machine is the quietest wet vacuum cleaner in its class and ideal for low-noise cleaning. With a 30-litre fresh water capacity and a 350 mm floor nozzle, this innovative spray extraction machine is especially suitable for cleaning large carpeted areas. 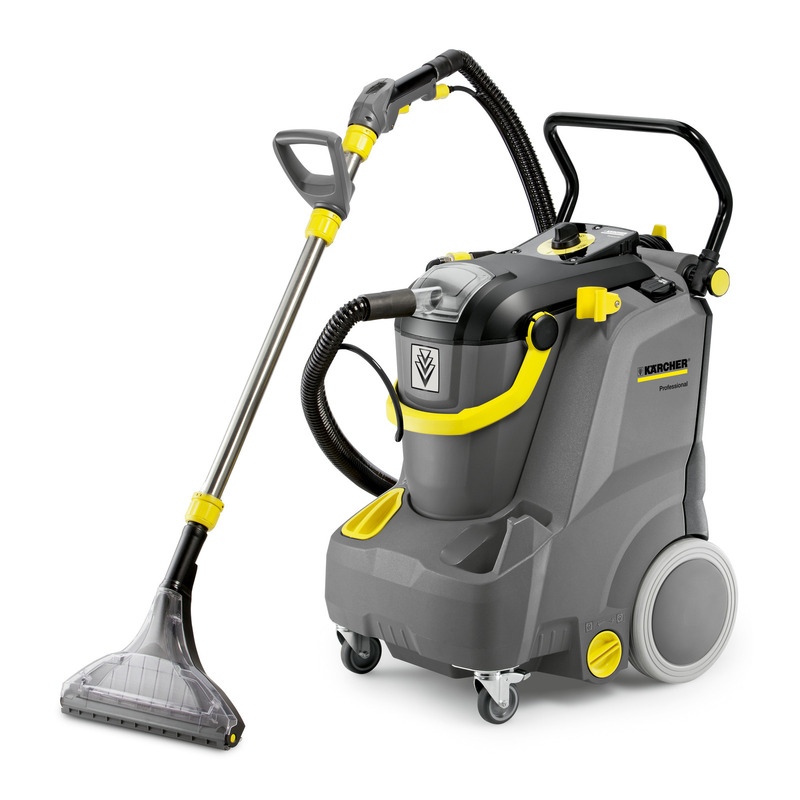 The machine design places great emphasis on ergonomic, stress-free and time-saving cleaning. The EASY-Operation concept and the ergonomic upright stance make handling much easier. The learning curve is smooth, thanks to easily understandable pictograms. The dirty water tank is removable, and the handle and shape of the tank are designed for ergonomic transport. The container is easy to clean, which also makes it suitable for filling the fresh water tank. The short set-up period saves time and money. The drying time with this machine is up to 30% shorter than with competitiveproducts. This is partially due to the flexible suction lip, which always assures an optimal suction angle. The Puzzi 30/4 is easy to carry, even when lying flat with a full fresh water tank, and its large castor wheels make it easy to transport over stairs.